The Harold B. Lee Library (HBLL) is located in the center of campus just south of the Administration Building. Enter through the doors on the east or west sides of the glass atrium at the north end of the building, or through the entrance on the south side of the building. 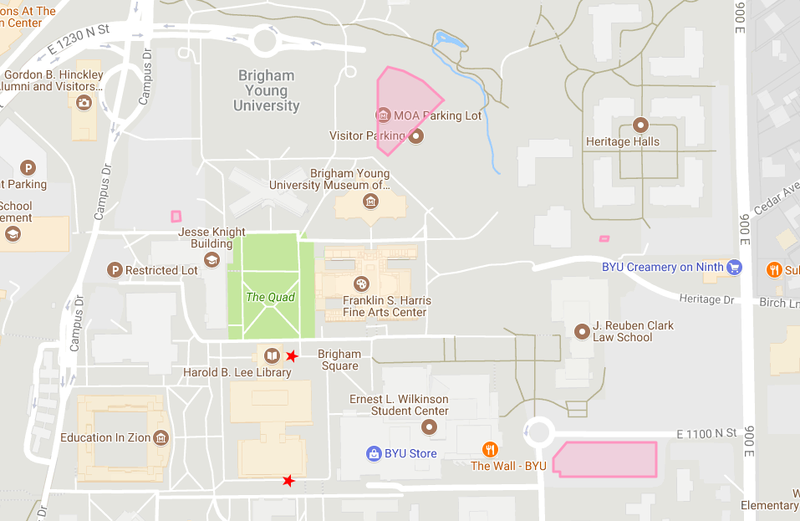 There are two main visitor parking lots that are about equal distance from the Library: one north of the Museum of Art and one east of the Wilkinson Student Center. When arriving at either of these lots, you will need to stop at the booth and ask for a visitor parking pass. Visitor parking lots in pink. Library entrances indicated by red stars.